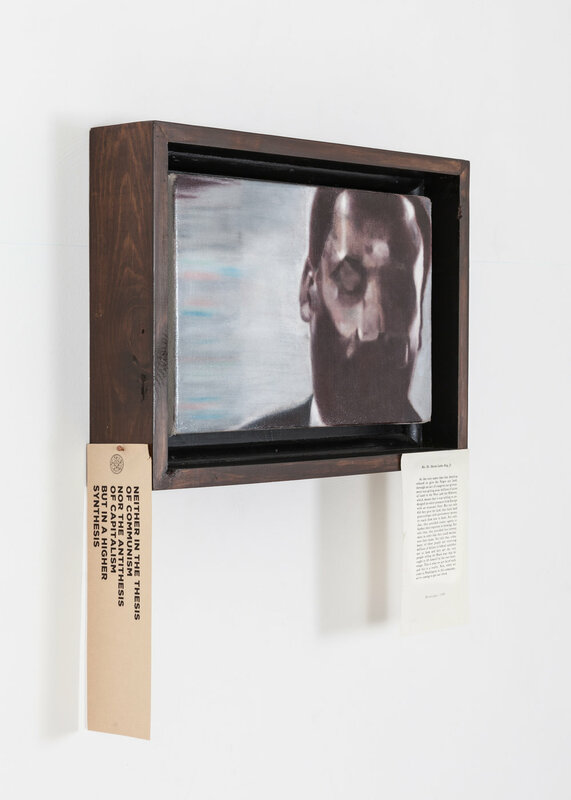 Jason Paterson is an Illinois based artist whose work predominantly deals with African American history, and social conditions. 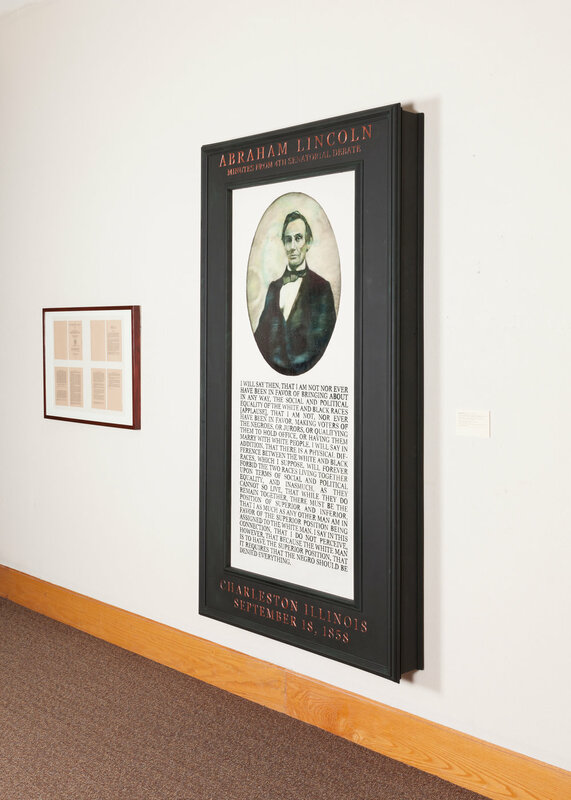 His work employs portraiture to chronicle the people, periods and cultural significance of the African American presence, through out the history of The United States. These works not only represent the people they depict, but also the visual media in which the original images were created—re-creating them through an original utilization of soft pastel. these works reference the cultural and historical importance of, photographs, film, and video: the technological tools we use to represent and identify ourselves, and visually organize and archive our existence. Zora J Murff: How did you get into art? Jason Patterson: I’ve been doing making art consistently since grade school. Even at that age, and especially when I got to middle school, I treated it like it was a practice. I remember trying to get better at certain things. It was doing things very one-dimensionally. I would mostly copy comic books using black rollerball pens and pencils. That was virtually all I did until high school. I went to community college from late 2003 to about 2006-2007, and that was the first time I painted. I didn’t really do well in school, but I had built this love for making art and being an artist, so I dropped out and never went back. ZJM: Can you describe your creative process? JP: It’s history based, mostly portraiture, although I’m slowly leaning out of that. That is not to say that I’ll stop making portraiture, but I’m branching out. I approach my work as if I was a historian., but instead of writing something, I make art. 60-70 percent of my practice is reading and planning, then I make the work; that’s my perception of it at least. One of the things that made me want to research was when I made this really in-depth piece about Barry Goldwater and Malcolm X. It’s wrong as far as the perspective I was going at it. I didn’t do enough research, and I had misinterpreted some of the history and context. That was really embarrassing – I sold the piece too, which is double-embarrassing. I love reading about the things I want to do. It makes the inspiration come more fluidly, and it also gives the work more integrity when I can have layers of historical accuracy added to the work. That’s the conceptual side of my process. When I was in community college I got into oil painting. That was fine, but it got boring because everybody oil paints, I didn’t feel like I was discovering anything. So I got into the academy style drawings of Pierre Paul Prud’hon, a French Neoclassic painter. He became famous because he treated his academic figure studies like actual pieces which was something people didn’t do in 1820s France. He used white chalk and charcoal to make full-figured studies. I liked how they looked and did tons of studies, and wondered to myself, “What if I used pastel on canvas?” For a couple of years, I did just black charcoal and white pastel on raw canvas, and I could make these things look just like paintings. That’s kind of where I took off and started developing this original style of drawing that looks like paintings, that looks like photographs, which is a layered thing. That’s where I’m at with my physical process, or least where I’ve steadily been for the last decade. The newer things I’ve been doing is a lot of woodworking, graphic design, and fake documentation (or artifacts on paper). ZJM: In your Instagram bio, you state that you are, “Researching the historical timeline of the African-American condition and experiences, and narrative. Can you talk about what that means to you, and how it relates to your work? JP: One of the things that I like to do with my work since it is historically based is to bring up parts of history that aren’t really well known. I've done this for awhile, but I got more specific with it when I started doing research and realizing that a majority of history that should be fundamental isn’t known. With my work, I try to put things in different contexts, bring up really important things that are not common knowledge that absolutely should be. I try to go from 1619 to the present and talk specifically about African-American condition in the context of what happened and how we got to where we are today. My focus ranges from slavery to “Jim Crow” or from the Transatlantic slave trade to the Caribbean to South Carolina. I think that one of the biggest issues in the racial divide in this county is that so much of what got us to where we’re at is unknown. It’s important to me to bring it back up, talk about it, and try to contextualize things better to people can understand. One of the more recent pieces that I did that was not portraiture was a literal timeline piece. In it, every year is represented by an inch and you have three eras: enslavement, Jim Crow, and basically post-Civil Rights movement to the present. Slavery was 246 years, Jim Crow was roughly 103 years, and if you count the last Civil Rights Act (1968 to present) that’s now 49 years. In the individual tapestries, slavery was twenty and a half feet, Jim Crow was about eight feet, and the last Civil Rights Act to the present is only four feet. So you have this massive tapestry that represents enslavement and you have these two short ones that represent everything else. This context is never talked about. The country is 240 years old, but enslavement in this land lasted 246 years. It will be 2111 before African-Americans will have been freed from enslavement, as long as we were enslaved. These are the contexts that I think are direly missing in the way we think about our history. ZJM: You mentioned the research that you do and that comes into your work. Is there anywhere else you tend to find inspiration? JP: The biggest inspiration when my practice turned serious was through friends of friends who were mechanical engineers. The way that they do their work and also their work ethic was a wonderful template for me to apply to my art practice. The way they think when they problem solve, they way that they structure everything – it was perfect for my mindset. My entire life I have struggled with ADD and Dyslexia, so structure is helpful for me. Most recently, my biggest influences are historians. I can’t tell you the last time I read anything about art, everything I read is by historians, sometimes sociologists, and sometimes journalists. It’s nice because historians aren’t as famous as artists or your average celebrity, and they are often educators, so I can approach them and ask them for help, and they help me. Its understandable, but it might be a bit harder to approach Kerry James Marshall level artists and ask for some help. ZJM: In some of your works, you reference photography. Why use photo as a reference? JP: When I was deciding what kind of artist I wanted to be, my biggest influence was Gerhard Richter. From the 60s to the 80s, he did a lot of photo paintings. I love the idea that the photograph isn’t a source reference, it’s a panting of the photograph, as its own object. In the same vane, I was tired of doing oil paintings because I though paintings as a representation of something had become redundant. Photography has been around since the 1830s, so why do we need to paint? (Of course there are good answer to that). But I really like the idea of making these drawings to talk about how we see images, and what’s real or not real to us. That’s one of the main themes of this Rodney King project I’m doing. The text under those images are from jurors and defense attorneys, and it’s problematic in two ways. For one, you can watch Rodney King not being able to get up, the police waiting for him to get up, and then beating him again. Two: the video is blurry, and as far as how our eyes work and how we see reality, it’s nonsense. But in the 200 years since photography’s existed we’ve believed it as real, because we test that video equals reality. If you went to the 1820s and showed them the Rodney King video, it wouldn’t look like anything to them, they’d think it was crazy, a bunch of blurry stuff. There’s nothing that would trigger their mind to say that’s a representation of life, but to us, it totally is. I’ll show the work of blurry images or distorted daguerreotypes, and people will ask if it is a real photograph or a drawing. But it doesn’t look real at all. That is why when I draw or recreate these images I represent the medium of photography, rather than just using it as a reference to try and make something. I want people to think about that redundancy. ZJM: I think this idea of text informing images interest me as well. 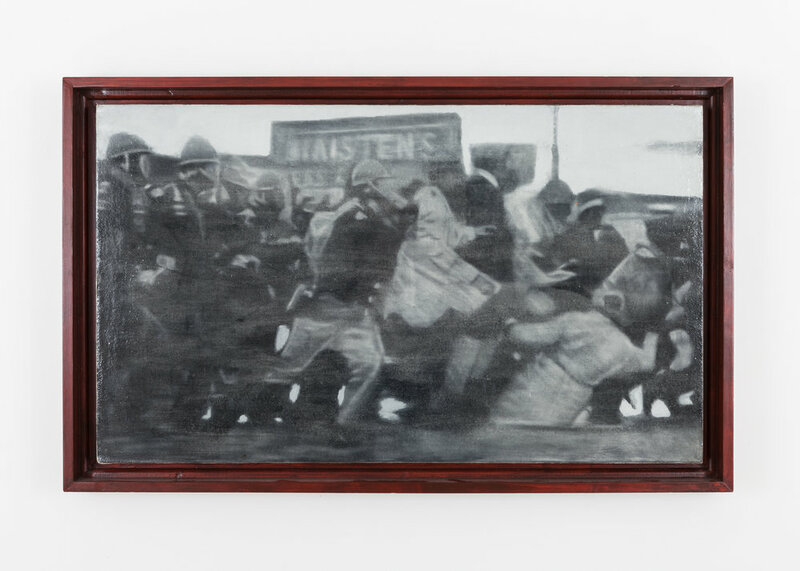 After seeing your work, I saw a Deborah Grant painting from her ‘Blackboard Series’ titled 56 Blows in which she references the Rodney King beating. This idea of making an image of something that captures images, and putting in text what was seen in the footage definitely reminded me of your work. JP: That does sound interesting. For the Rodney King pieces I got the actual newspaper articles that I got from a follower on Twitter. At the time, I was making a portrait of Clarence Thomas and posted it on Twitter. The follower responded and told me that she had a stake of Washington Posts that are about the Anita Hill hearings. She sent them to me, and as I was going through them, I stumbled across coverage of the first Rodney King trial that had just ended. At the same time, I had just read an article about new paper on the superhumanization of African-Americans, and the text under these images are exactly what this article is talking about. The first one says that Rodney King was moving as fast as any professional linebacker. Why did he said it that way? King was drink out of his mind, he was tasered, there were six cops around him, but he chose to describe King as being a person at the pinnacle of their power and strength. This is a good example of when people call racism a disease. When a guy is being beaten and tasered, and you feel comfortable and confident that he was in control the whole time, that can’t just be a normal thing. There has to be something else connected to that. I felt that I absolutely had to make these. And this goes into one of the things that I really love doing in my practice, and again goes back to Richter. In the 60s, Richter had the idea of making art and trying to take all the art out of it. You essentially make it as boring as possible. You find something, you re-make it, and that’s it. Of course you can’t actually take the art out of it, but that’s essentially what I try to do. Everything is straightforward and banal and as boring as I can make it. It never really is, and I think that gives it this splash of creativity in a really ironic way. I want to write an essay about the piece. One of the best books that have bene useful for it is The Condemnation of Blackness by Khalil Gibran Muhammad. In it he breaks down the assumption that criminality was inherent in African-Americans from both the liberal and conservative perspectives. He talks about Teddy Roosevelt, who was an progressive equal rights champion in his era. Roosevelt went to Tuskegee and tells these African-American graduates that they should take pride in the fact that they overcame the inherent criminality in them, and that that sort of criminal nature inside them is more detrimental to African-Americans than anything that a white person could do to them. But he was the first president to have a Black person eat at the White House when he invited Booker T. Washington and his wife. Going back again to what I was saying earlier with my overall view: I want things to be put in better perspective. We can celebrate Teddy Roosevelt in a lot of ways, but we can’t forget how wrong he was in a lot of ways. That’s the way I’m trying to reframe history. ZJM: What can we expect next from you? JP: To put it short, better work. I feel like the ideas I have now are better than ideas I’ve had in the past, which should be the case. I don’t think I’ll ever stop making portraits, but I really want to have a solid body of work that isn't portraiture. The main project that I'm working on now, outside of the Rodney King project, is called Partus Sequitur Ventrum, which is about the history of Black women in the Americas. Of course African-Americans are not correctly represented throughout history, the atrocities have been watered down, but it's going to be double for African-American women. There is racial inequality, racism, and white supremacy, but there's even longer standing misogyny and sexism. Through the researchand the work that I produce, I want to show how fundamental the work and the overall presence of African-American women has been, and how it's never adequately represented and never talked about. ZJM: Thank you Jason, it was a pleasure meeting and speaking with you. JP: Same on my end. I really appreciate the opportunity. To contact Jason about his work, please visit his website.